* Providing the A's to the 5 HIGHLY RECOMMENDED Q's today is Matt Dorrien, a singer-songer with a lovely new record coming out on Mama Bird Recording Co. in April—go listen / pre-order it over on Bandcamp now (it's nice). This is tough because there are definitely a few artists and albums/songs I could go on and on about. There’s a new album by a songwriter who goes by Bedouine that I’m in love with right now. But I think my recommendation is going to have to be Nilsson Sings Newman. It’s an album of a few choice songs by Randy Newman, sung by Harry Nilsson with Newman on the piano, that came out in 1970. Every song on the album is golden, and the sparseness of the arrangements really highlight the beauty of the songs and Nilsson’s interpretations of them. Newman is so adept at capturing the irony and poinegnancy of human experiences, and his piano and orchestral arrangements on his own albums are bar none some of the prettiest ever written. Harry Nilsson was an incredible songwriter in his own right, and had one of the loveliest male tenors in modern pop music history (still unparalleled in my humble opinion), so the fact that they cut an album together is Beatlesque in its historical and musical significance. When I first sat and listened to Nilsson Sings Newman it was winter in New York and the weather and landscape seemed to reflect the emotional timbre of the album. I would start with Living Without You for a good cry. Also very very difficult to stay succinct in answering this question. I just binge watched all of seasons 2-4 of Black Mirror on Netflix. So good. But I’m going to have to say I absolutely loved Lady Bird, Greta Gerwig’s semi-autobiographical coming of age masterpiece. It’s an important film for so many reasons, especially given the current social and political climate we’re in right now with the impact of the #metoo movement. The writing is flawless in its humor and sadness, and Saoirse Ronan and Laurie Metcalf passionately embody their characters, and effortlessly portray one of the most authentic and moving mother and daughter relationships ever to grace the big screen. Go see it! Again, given the limitless library of brilliant literary work out there, this will be a tough question to give a limited answer to. I loved Underground Railroad by Colson Whitehead that came out last year. It won the Pulitzer Prize, and rightly so. A brilliant reimagining of a literal Underground Railroad that tunnels underneath the Antebellum South, transporting slaves from plantations to freedom in the North. However, I’m going to recommend someone who has become one of, if not my absolute favorite author ever. 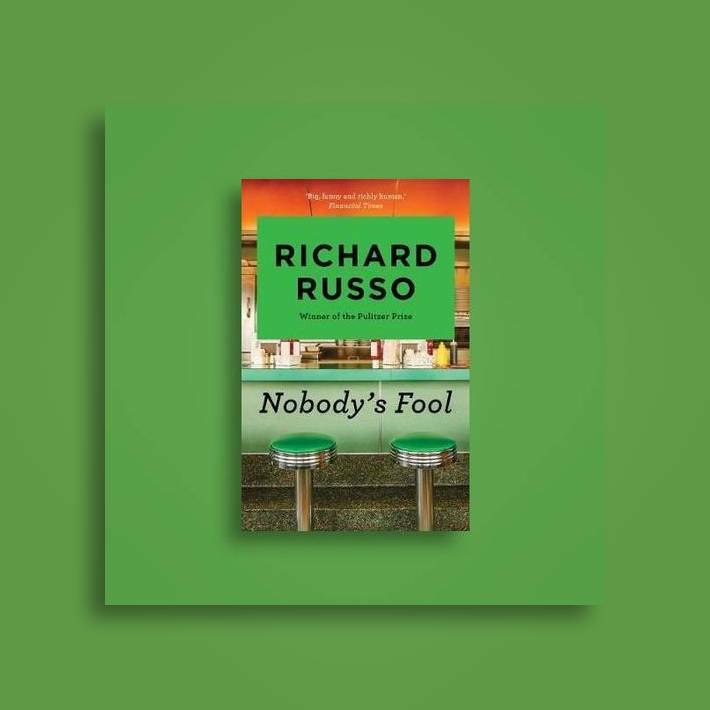 His name is Richard Russo, and he won the Pulitzer Prize for his masterpiece Empire Falls a few years ago. I read that novel and loved it so much that I ended up binge reading most of his literary repertoire soon thereafter. Start with Empire Falls, but read Nobody’s Fool immediately after. Russo is a master of prose. And, similar to writer’s like Sherwood Anderson, he is a loving chronicler of life in the American small town. Nobody’s Fool is about a man named Donald “Sully” Sullivan who many think wasted his life away, and for whom befalls only bad luck. However, despite his many flaws you soon find that he is richly endowed with humor(dialogue is perfection. Sully’s quips are some of the best in literature), compassion, and keen intelligence. They also made a movie based on the novel of the same name, and it stars Paul Newman (one of the finest performances of Newman’s latter career) and it is one of my favorite cinematic adaptations of a book ever made. I’m embarrassed to admit that it would have to be Instagram. I’ve come to rely so heavily on it as a promotional tool in my musical career that I’m not sure what life would be like without it at this point. #5 - AND FINALLY… PLEASE GIVE ONE COMPLETELY UNAIDED RECOMMENDATION THAT YOU THINK EVERYONE SHOULD START DOING / USING / WATCHING / EATING / THINKING / QUITTING / ETC-ING TO MAKE THEIR LIVES A LITTLE BIT MORE BETTER AND/OR BEARABLE. Sauna. In December, in order to combat the seasonal affective disorder that has plagued me these last few winters since moving to Portland, I acquired a gym membership. The gym where I go has a sauna, and boy let me tell you, it saved my life! Sometimes I go to the gym and I don’t even work out. I just sit in the sauna for an hour. OK folks, there you have it. Things that Matt Dorrien thinks you should consider incorporating into your day/life. Before you log off and go get your sweat on in a nearby sauna, make sure to follow Matt on the Instagram / Twitter / Facebook and definitely go cop that lovely new lp (it's nice).